Here is a step-by-step example demonstrating how to test the delegation facilities in ProtoGENI. 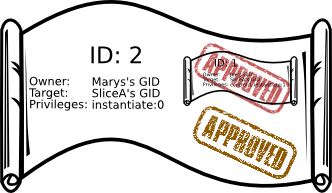 The example assumes that an existing user named joe using a federated site example.org wishes to delegate all privileges on slice mytestslice to a new user who will be called mary. Unless otherwise specified, please assume that all operations should be carried out as joe on a ProtoGENI ops node, under the protogeni/test directory within a testbed checkout. Please note that delegation requires the XMLSec software to be installed on the ops node; this should be done on all ProtoGENI sites. If your ops node does not yet have it, you or your system administrator should perform the installation now (you can do this using the /usr/ports/security/xmlsec1 port). If the mary user has not been created, please request an account for her through the Emulab WWW interface. This will require the approval of the head of whichever project she chooses to join. Once the account is created, she must create an SSL certificate (which is also done under the WWW interface; via the "My Emulab" and "Generate SSL Cert" links). The delegation facilities are under active development, and more sophisticated operations (such as delegating a proper subset of a user's privileges) should be available in the near future.